And the total is (drum roll)…..24lb 13oz. grown on 200 sq ft. This is an awesome amount, twice as much as the average expected yield. I was hoping for 30 but I was getting a little greedy. This means that all you potentially need is 400-500 sq ft. to grow 50 lbs. of barley. Now in terms of beers per square foot. Let’s say I could easily brew two 5 gallon batches of beer with 24lbs. of barley. Even accounting for losses in the malting process I would probably have some left over. So 38 Litres divided by 355 mL (average bottle size) equals 107 bottles of beer. One bottle for every two square feet, (not one bottle per one square foot as I had estimated previously in the comment section). Below is a picture of the two bins of unthreshed barley which by the way only took an afternoon to thresh AND winnow thanks to the drill thresher. I even bought a smaller paint mixer which fit on my drill properly so I could move it up and down easier. 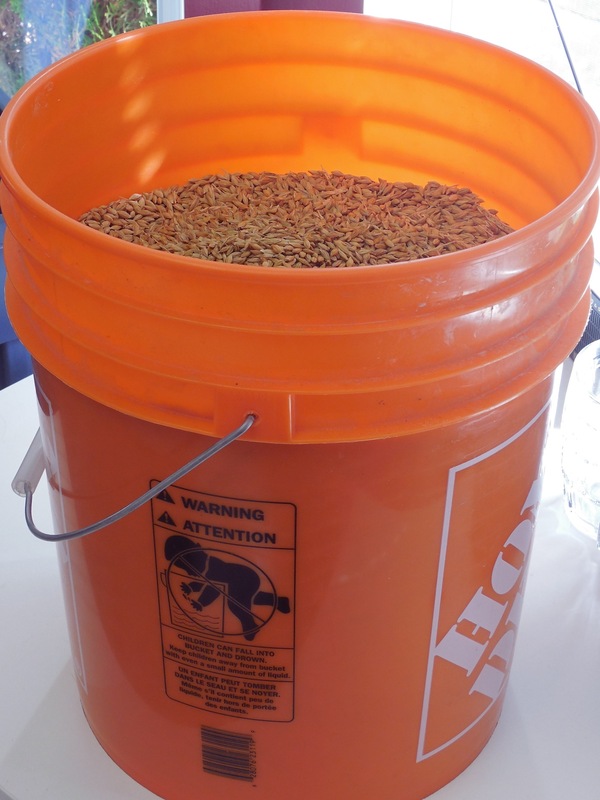 This year I plan to make more diastatic brown malt. I’d like to determine how dark I can get it and how this affects enzyme loss. Once the ideal colour vs. extract is determined I’ll make up another small batch to make a more accurate pre-industrial porter. Since I’ll have lots of barley left I’m open to suggestions: What kind of malt do you want to see me make or even re-make this year? Cheers! The last thing I want to do is to discourage anyone from trying to grow their own grain. I realize that harvesting my grain by hand looked pretty time consuming and downright crazy (it really wasn’t that bad). So this week I came across an awesome time saving idea to thresh small amounts of grain. I’ll be honest I wasn’t looking forward to threshing this years crop in pillow cases like I’ve done before. This idea utilizes cheap simple things you might already have around the house. You’ll need a 5 gallon bucket with a lid, a drill, a long piece of metal that can fit on to your drill or a paint mixer and two pieces of chain. If you use a paint mixer it’s easy to attach the chain with a couple of carabiners or chain links. I saw this idea on one of Paul Wheatons videos of Brian Kerkvliets farm. I caught him on film. I had suspected birds because I had seen birds cut the stems with their beaks to get at the seed heads. This morning I heard some rustling noises and then watched as a single stem of barley was pulled through the chicken wire. Unfortunately for this poor rat there was no longer a seed head on it, but he quickly moved on to the next stem, chewed the base of it and then pulled it down with his furry little paws. It was kind of comical to watch, like the old cartoons where the gophers would steal vegetables from underground. I think they took about a pound or two in total so things could have been worse. 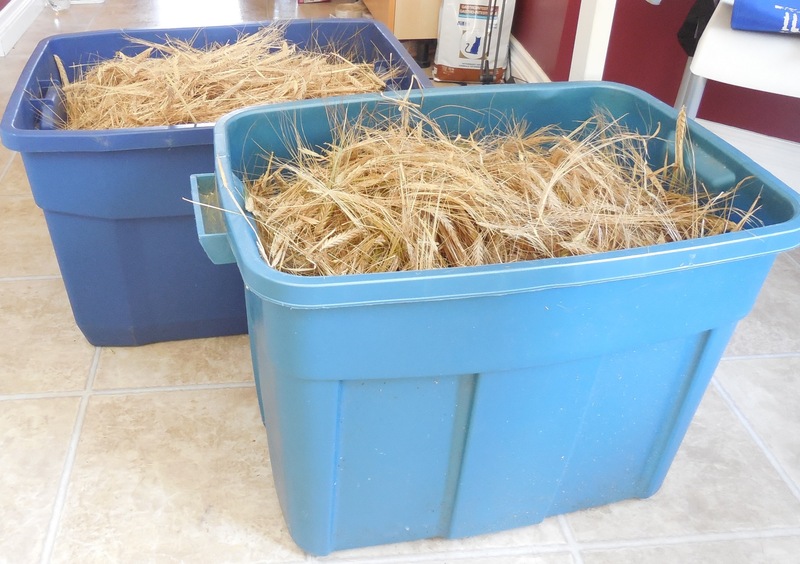 I’ve pretty much harvested all of the barley so I am going to let it dry out for a couple of weeks before threshing it. The dryer it is the easier it is to thresh (the kernels separate easier) and the kernels are hard enough so they’re not damaged in the process. This years crop is going to be fantastic. I’ve taken out a little over 30 lbs of grain (not yet threshed) and I’m guessing there is another 5 lbs still in the garden that’s not quite ready yet. So I’m thinking once it’s dry, threshed and winnowed I’ll have 30 lbs of grain ready to be malted. This is pretty awesome for 200 sq ft. of garden. Normally 12- 15 lbs on 200 sq ft. is pretty good. We had some great weather this summer but what really made this possible was the chicken wire set-up which allowed the barley to grow very thick and not fall over. Of course this system is totally impossible on a large scale but well worth it for a backyard gardener. I’ve recently read that many barley farmers spray their crops with growth inhibitors to prevent lodging. This combined with wide spacing of plants and low nitrogen soil prevents lodging on a large farm and keeps the protein levels low in the barley. But I want to grow as much barley as nature will allow in a very small area. I won’t know what my protein levels will be but I’ll probably get an idea when I brew with it.